I have literally played The Legend of Zelda: Ocarina of Time dozens of times! I’ve also owned at least one version of the game constantly since its initial release. I can easily say that there hasn’t been a year in that time that I haven’t played Ocarina of Time at least once, if not more! That is just a testament to how great this game is! I think the only other game I have played even close to as many times is Super Mario Bros. 3. Needless to say, I picked up my copy of The Legend of Zelda: Ocarina of Time 3D first thing Father’s Day morning and I’ve been playing it as much as I can! I took a break just as I reached the Water Temple to share some of the little things I’ve noticed that have yet to be reported. Now, these aren’t the visual easter eggs that Mases has talked about, but game elements! Find out what I’m talking about after the jump! The first little thing I noticed was with the bugs and the soft soil. As those of you who have played Ocarina before will most likely know, when you scoop up a bug in a bottle it will multiply into 3 bugs when you drop it out of the bottle (HINT: for most of the soft soil in Hyrule, a bug dropped in will produce a Golden Skulltula). I always took this to my advantage and would open the bottle of bugs into the soft soil and quickly scoop up one of the 3 scampering bugs and be on my way. Well, this was kind of a cheat that the game either let you do, or the programmers didn’t know about, so you never had to search out bugs after you caught your first. In the new version, all 3 bugs scamper into the soft soil and you cannot pick them up. 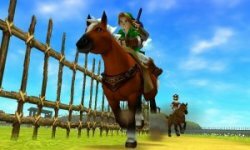 In the original game with a bit of practice, you could get Epona to do an automatic 180. Basically what you could achieve was to completely reverse Epona’s direction without the time or animation of her turning around. This could only be done if she was standing still and it took a bit of practice, but I usually would use this in the midst of the timed sections of the Trading Sequence to give me that added second or two. As with the bugs, this may have been unknown to the programmers and it was a bit of a cheat. This may have been mentioned in another post, but climbing is a little bit faster in the new version of Ocarina of Time 3D. Most of the time this changes nothing in the game, other than makes the climbing not so monotonous. However, the final leg of the Trading Sequence ends with climbing the wall on Death Mountain and time is of the essence at that point. So, the faster climbing gives a tiny edge to the end of the Trading Sequence! This is extremely minor, but I noticed it, so I thought I’d share. At the end of the Forest Temple, after you’ve beaten all of the Poe sisters, an elevator (shown in the image to the left) pops up allowing you to access the basement and ultimately the boss. Well, one thing I always liked to do was hop on and back off the elevator right before heading to the boss room. This would send the elevator up and leave me down in the room. In the new version, I did this out of habit, and it didn’t let me hop right off, instead Link stopped and the elevator rose and I had to get back on and ride down again. If I notice anything else as I continue through the game I’ll be sure to share it with you. What do you think of these changes? Is there any little changes that you have noticed are different in the 3Ds version? Be sure to comment below!